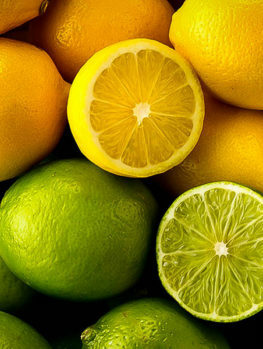 Citrus fruits are a big family that has been cultivated and bred in the East for many centuries. 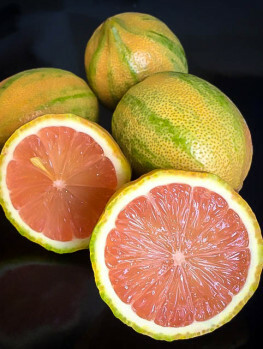 Starting from a few species, many hybrids were produced by those early growers to give us the main types – oranges, lemons, limes and grapefruit that we know and love today. 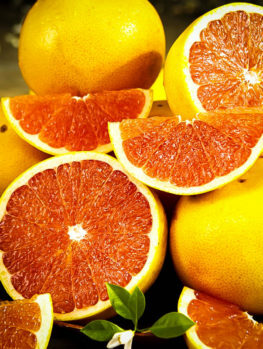 Citrus are so useful for sweet and savory dishes it is hard to imagine cooking without them. So growing as many as you can in your own garden, in the ground or in pots, make a lot of sense if you want access to these wonderful golden fruits when they are as fresh and ripe as possible. 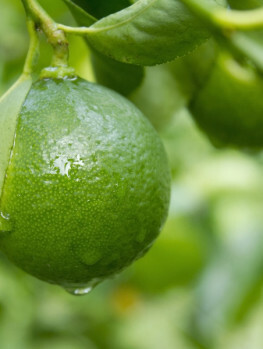 Many of the commercial varieties available in stores are not necessarily the best for flavor and interest, so growing novel varieties, like Key Lime Trees or Meyer Lemon Trees in your garden gives you access to these exotic and truly special types of citrus fruits. 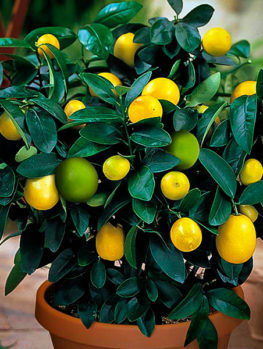 Citrus are easy to grow in suitable climates and since many adapt well to growing in pots, everyone can have their own special citrus fruits right from the garden. 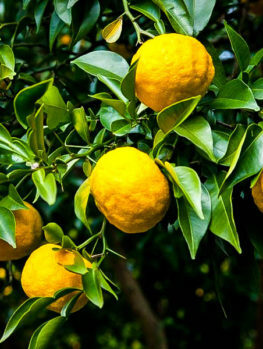 Citrus Trees are small to medium sized evergreen trees growing 15 to 40 feet in height, with most of the best varieties being in the smaller size-range. They make interesting specimen trees for the garden and can be grown in pairs along a driveway, or used to separate the vegetable garden from your main garden. They also look charming growing in pots, with their colorful fruits hanging down. When these trees were first introduced into Europe they were often grown in large pots so that they could be brought inside for the winter, something that is still easy to do if you live in a cooler region. 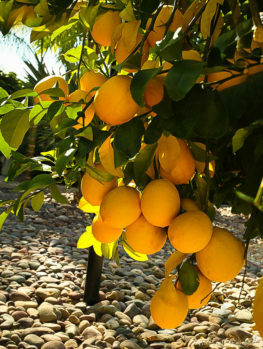 Of course the main reason to grow Citrus Trees is to enjoy their fruits and there is a wide variety available. 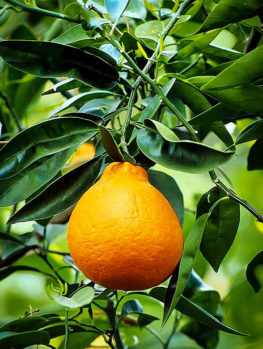 From lemons and oranges to kumquats and satsumas there is a citrus tree that is right for you and will bring pleasure to your garden and usefulness into your kitchen. 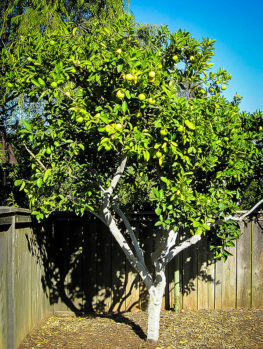 Citrus Trees grow into small or medium sized rounded trees, usually with one or a few central trunks of smooth bark of a dull grey color. They grow 15 to 25 feet tall, with some reaching up to 40 feet. The leaves are thick, glossy and deep green in color. The flowers usually appear in spring, but citrus trees can flower at other times of year and may sometimes have fruit and flowers at the same time. The flowers are white and usually sweetly fragrant – orange blossom is a popular perfume for soaps and bath products. 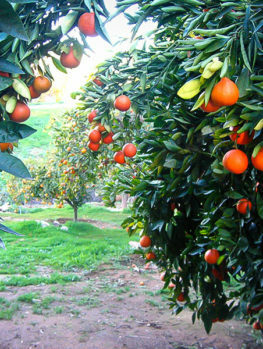 The fruits which follow take several months to ripen so that fruit is often ripe during winter. Fruits last on the tree well, and can also be stored in cool conditions for some time. 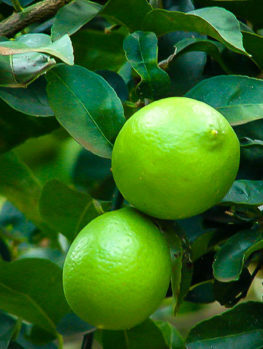 There are several groups of Citrus Trees and many different varieties. 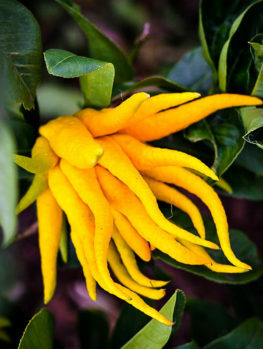 Since the more common types of Citrus are readily available in stores, here at the Tree Center we specialize in unusual varieties rarely available in stores but that are interesting and exciting plants to grow for their beauty and for the many uses of their fruits. 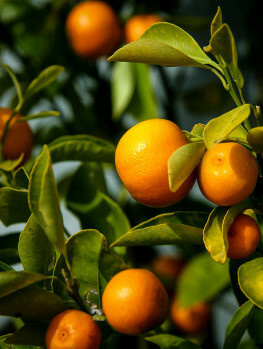 Orange Trees (Citrus sinensis) are the most widely cultivated fruit tree in the world. They are evergreen trees growing eventually to around 30 feet tall but they are usually pruned to keep them smaller. 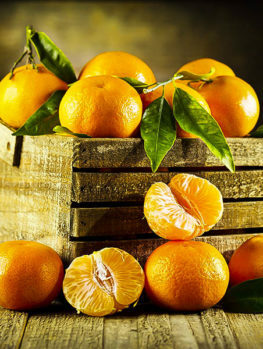 There are several important types of orange, including Seville, Valencia and Navel oranges, but one which has become very prized is the Blood Orange Tree. 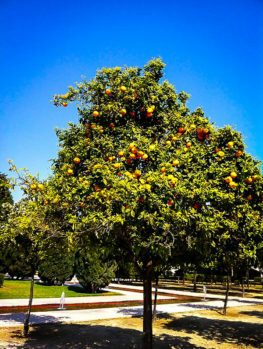 What makes this tree special is that the flesh of the fruit is a rich, dark red, sweet and with a delicious flavor. 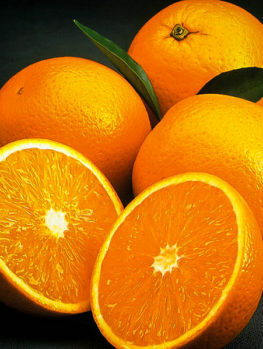 It is very popular with cooks for salads and desserts and if you only have room for one orange, this is a great choice as the fruit is rarely available in stores. 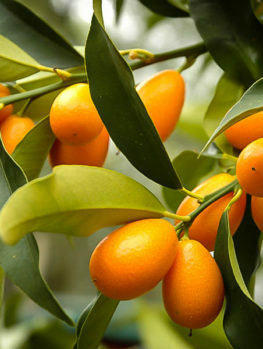 The Calamondin Orange Tree (Citrus x microcarpa) originated in the Philippines and grows into a small tree never taller than 20 feet. 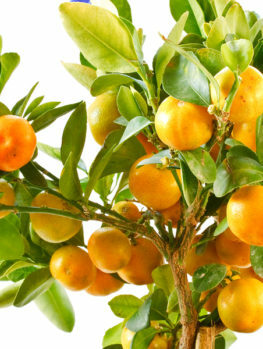 The fruit is small but the tree bears so profusely it can be laden down with bright orange fruits. 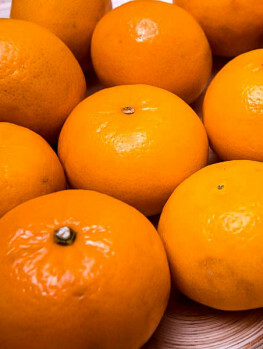 These have an orange flesh which is sour like a lemon but a sweet peel and the fruit is used unpeeled to make drinks, pureed as a sauce or for marmalade. 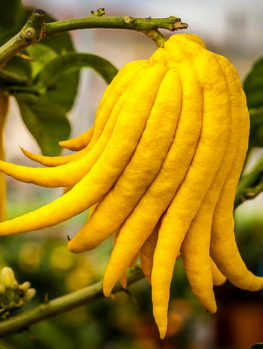 It can also be used wherever lemon is used for sweet or savory dishes, giving its own distinct flavor and character to every dish. The tree is frost sensitive but makes an excellent container plant as it is naturally small and will fruit well in a large pot. 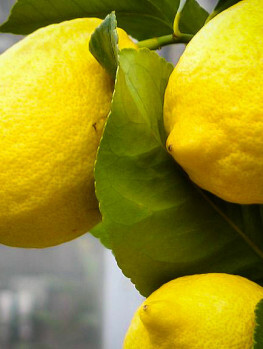 Lemon Trees (Citrus x limon) are favored for their tangy juice and rind and are of course widely used in lemonade, pies and savory cooking. They grow into a medium sized tree that often bears fruit all year round, although there is a peak season. 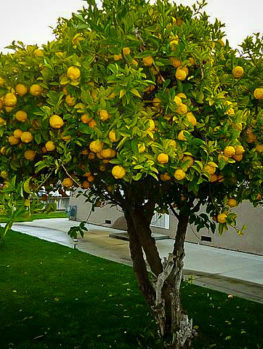 The Eureka Lemon Tree is an excellent variety from California which fruits at its peak in spring and summer, while most lemons peak in fall and winter. 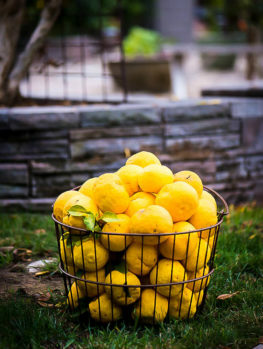 The Meyer Lemon Tree is a cross between the lemon and the Mandarin Orange, so it has a thin skin and a juice which is not as sour as other lemons, making it a favorite choice in the kitchen. 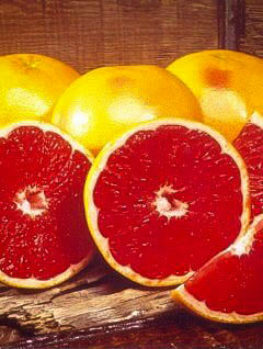 Grapefruit (Citrus x paradisi) are immensely popular for breakfast and for their diet properties, but the Ruby Red Grapefruit Tree not only has beautiful red flesh it is extra sweet and juicy too. 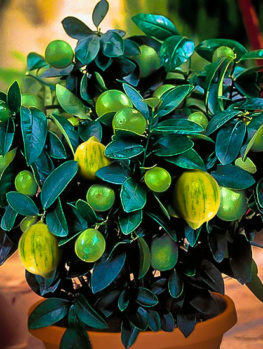 The Key Lime Tree (Citrus x aurantiifolia) produces the famous Key Limes so popular for pies because of their unique flavor, but they can also be used as regular limes for drinks and cooking. 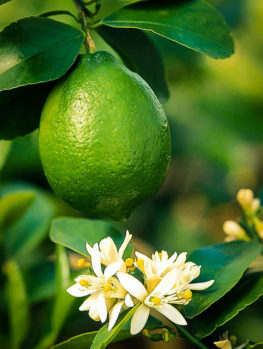 Another popular lime is the Persian Lime Tree (Citrus x latifolia) which is the lime most widely enjoyed for its distinctive lime flavor and scent. 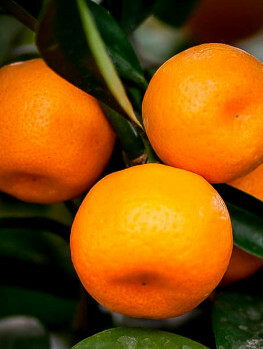 The Clementine Tree (Citrus reticulata) and the related Owari Satsuma Tree both have a thin skin which can be quickly removed and sweet fruit that separates into segments easily. 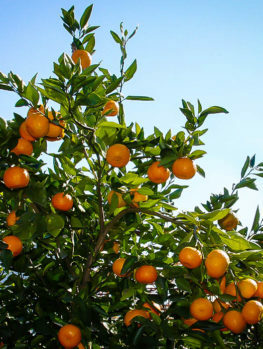 The Owari Satsuma Tree fruits in fall and has no seeds, while the Clementine Tree fruits over the Christmas season, so growing both types will give fruit for almost half a year. 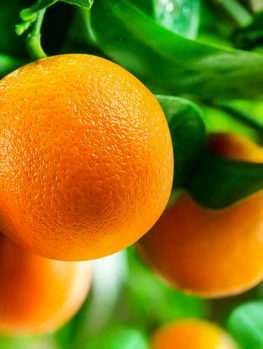 The Tangelo Tree (Citrus x tangelo) is a cross between a grapefruit and a clementine. 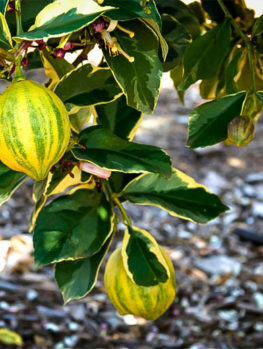 It has large fruits that ripen during winter and are extremely juicy and sweet. They are as easy to peel as a clementine. 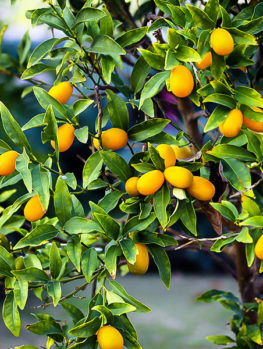 The Nagami Kumquat Tree (Citrus japonica) is so distinctive it was once not considered to be a Citrus, just a relative. 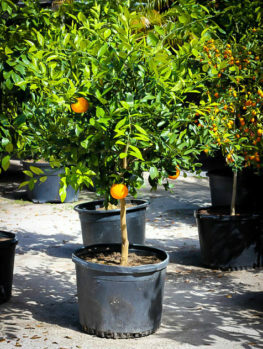 It grows into a small tree and makes an ideal potted citrus that is covered is tiny oval ‘oranges’ all winter. It always crops well and can hundreds of fruits. 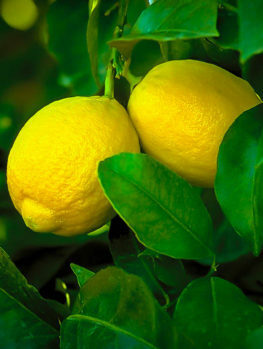 These can be eaten whole and have a refreshing effect, since the skin is sweet and the flesh is sour like a lemon. They are also often preserved in spiced sugar syrup and used like a pickle with cheese or cold-cuts. 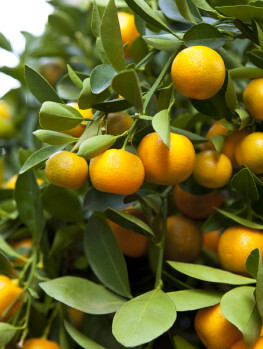 Citrus Trees are hardy from zones 9 to 11 and will only tolerate a very little frost. However, if you are not fortunate enough to live in these warm zones many make excellent small trees for pots and can be kept indoors during winter. Once the night temperatures fall to 400F they should be brought inside to a sunny window and kept there until the temperatures are back over 400F in the spring. Most citrus like plenty of water, but they do not like poorly drained soil. 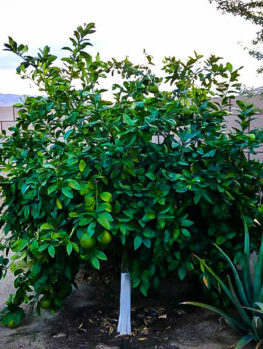 The soil should be rich, but do not give your citrus trees in the ground or in pots too much nitrogen fertilizer or they will grow leaves but not too much fruit. 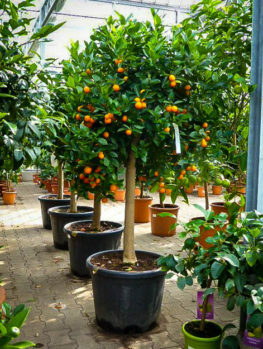 Citrus Trees should be planted in a sunny location into well-dug soil enriched with organic material like garden compost or rotted manure. 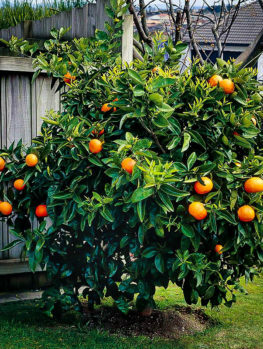 Choose a spot where there is enough room for your citrus tree to reach its full size. 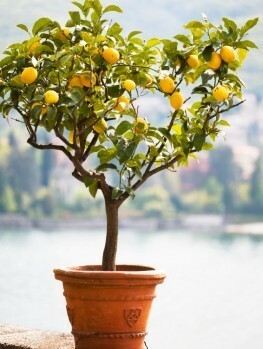 Water your new Citrus Tree well once a week during its first season and after that just when the soil becomes dry. For planting into pots choose a clay pot rather than plastic which tends to hold too much water. Let the soil become somewhat dry between each watering. 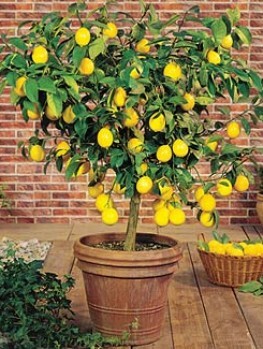 Citrus Trees in the garden or in pots should be fertilized in spring. 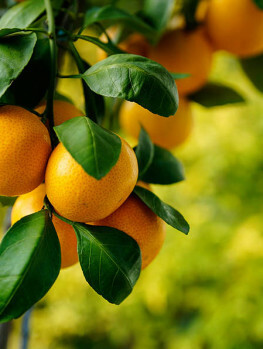 Special citrus fertilizers are available and are the best choice for feeding your Citrus Trees. Only a little pruning is needed – and in fact you should try not to prune your trees too much as that will reduce fruiting. Just keep the tree from becoming too bushy by removing some inner branches and remove lower branches as the tree grows so that they develop a tree form. Long shoots should be cut back to make them branch and to keep your tree from becoming too tall. 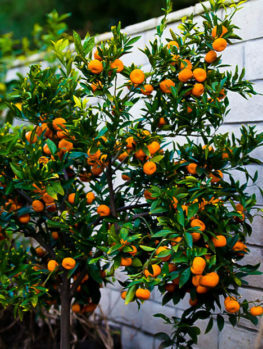 Dwarf plants like the Nagami Kumquat Tree usually need little or no pruning, especially when growing in pots. 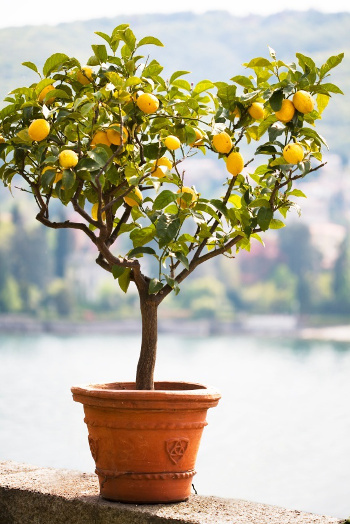 Because Citrus Trees come in so many varieties they offer lots of exciting possibilities for decorating your garden, terrace, pool area or solarium. As well you can bring all kinds of different fruits into the kitchen to liven up your cooking and give healthy variety to your family.